It's a file containing the details and work policies that apply to an individual employee. Setting up employees' profiles is the last step in preparing your software to be used. When you set up an employee, you'll tell the software the employee's name and choose from the shifts, Pay Types and overtime and holiday schedules you set up earlier. This is also where you assign iButtons to employees and/or issue them their four-digit User ID, which allows them to clock in without an iButton. You'll create your Employee Profiles in the Setup Wizard, which appears the first time you start your TimePilot software. You can edit your Employee Profiles or add or delete an Employee Profile by clicking on the Setup menu in TimePilot Central and choosing "Profile Setup... ." To edit or delete an Employee Profile, click on the name of the employee and then the appropriate button. To create an Employee Profile, click the "Add a Profile" button. The instructions below are keyed to the screenshot above. Enter the employee's name in the box at the top. Entering the last name first ensures that employees' names will appear in alphabetical order on reports. Make sure the box next to "Active" is checked. When this box is checked, the employee is able to use the TimePilot system. If it's not checked, the employee cannot use the system and no transactions will be generated. Inactive employees will not be a part of the current pay period and will not appear on reports. TimePilot Vetro has a screen that displays the employee's name when he or she clocks in. If you have Vetro, enter what you want the screen to display. The entry is limited to 15 characters because that's the width of the screen. Choose the employee's location, Company, Shift, Department, Pay Type and Holiday Schedule from the drop-down boxes. Will this employee have the Auto Lunch function applied to his or her schedule? If so, make sure there's a check in the checkbox and set the number of minutes that will be subtracted from their time for their lunch break. Note: Auto Lunch also needs to be set up in the Administrative menu in TimePilot Central before it can be used. Will this employee clock in with an ID number or an iButton? If your TimePilot timeclock doesn't have a keypad, you have no choice: you have to use iButtons. If you have both a keypad and iButton probes (round, silver sensors about the size of a quarter) on your clock, you can use either method, or even "mix and match": have some employees clock in with an ID number and some with iButtons. If your clock has no probes, you'll need to use ID numbers. Note: Users of TimePilot PC can purchase the optional iButton Receptor (shown at right), which plugs into your computer's USB port and allows the use of iButtons. ID Number: Click the checkbox next to "Enable User ID Entry," then enter a four-digit number from 0000 to 9999. The number must be unique—it's used to identify an individual user to the timeclock system, so numbers cannot be shared among employees. An error message will pop up if the ID number has been assigned to another user. The number can be typed in directly from the iButton (it's the 12-digit number on the metal face of the iButton). If you have a TimePilot system that is cabled to your PC, or you're using the optional iButton Receptor, the software can read an iButton and enter the number automatically. Click the "Get iButton number" button on the screen. The "Get iButton" box will pop up. 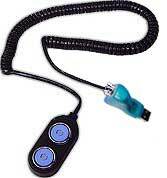 Tap the iButton to the system that's cabled to your PC or the iButton Receptor, choose the color of your keyfob and click "OK." To avoid confusion, if you're adding new employees to the system while current employees are clocking in, we suggest that you type in the serial number manually. Note: If an employee leaves the company in the middle of a pay period and does not return his or her iButton, you can disable it quickly and easily by deleting the employee's iButton serial number. This will disable the iButton but allow the employee's name to show up on all reports. Once the employee is no longer a part of a pay period, his or her profile can be deleted. Please remember that this will not stop an employee from clocking in if you also allow them to clock in using a four-digit ID number on the keypad. To prevent that, remove the check from the "Active" checkbox on the employee status screen. (See step 1 above). If you plan to use Snap-To and/or Late/Early Tracking, make sure there's a check in the appropriate checkbox. For details on Snap-To, click here and here; for details on Late/Early Tracking, click here. Fill in as much or as little information on this screen as you wish. If your company treats employees' birthdays as holidays, make sure you enter a birthdate here so the software knows when the employee should receive that holiday. For more on holidays, click here. If you enter an hourly wage here, you'll be able to see the employee's total gross pay when you generate some selected reports. If you don't want to use the traditional multiplier for overtime—time and a half or double-time—you can set exact pay rates here. For more information and instructions on how to set up this function, click here. When you're done, click "Save." Repeat the process for each employee.